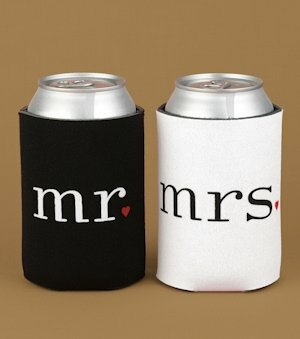 One of our most popular bride and groom koozies! Keep your beverages cold with our fun "mr." and "mrs." can coolers. The simple, yet contemporary design will make a statement at almost any gathering. Your beverages will definitely be set apart in these creative coolers. The foam material helps keep beverages cold for your enjoyment by acting as an insulated can holder. Black and white foam coolers measure 4-1/8" tall and come in a set of two: one Mr. and one Mrs.